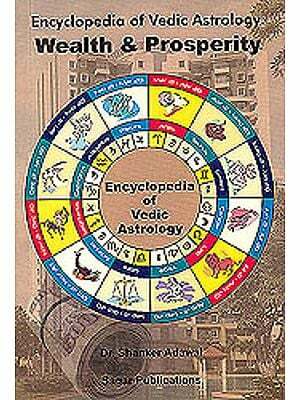 Three Hundred Important Combination is intended to provide knowledge of the Yogas which indicate specific horoscopic trends. 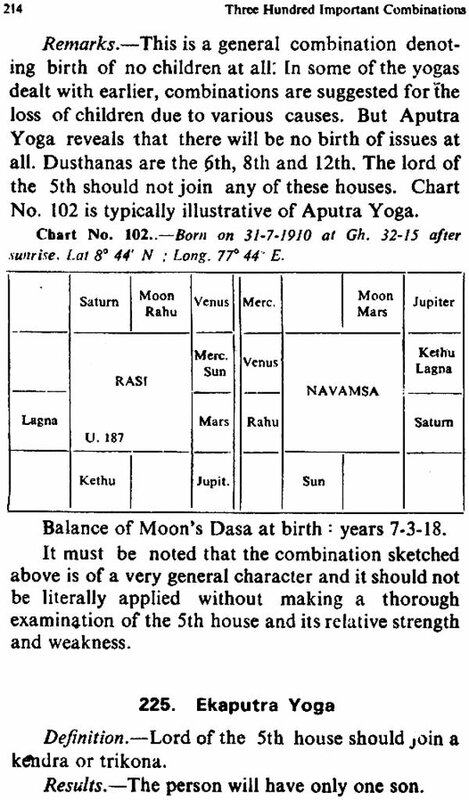 All planetary combinations are divided into two groups viz., Yogas and Aristhas or fortunes and misfortunes. It deals with various standing combinations of yogas. 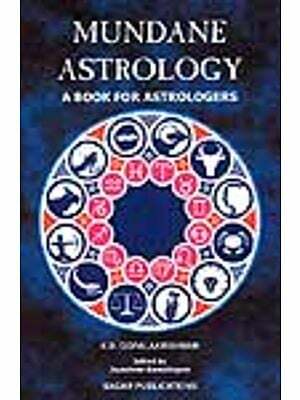 The systematized account of all the important yogas is brought out so that it may illustrate practical horoscopes. The book certainly claims credit for being the first to bring together all scattered information and present it systematically. 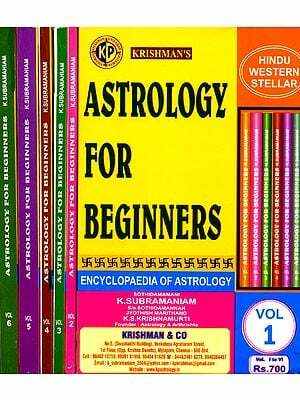 Dr. B.V. Raman was the renowned astrologer and author. He was the Chief Editor of The astrological Magazine. He had number of titles to his credit. He held a string of titles such as Abhinava Varahamihira, Jyotisha Bhaskara, Jyotisha Bhooshana etc. He was a Fellow of the Royal Asiatic Society. Dr. Raman had influenced the educated public and made them astronomy, Astro-psychology, weather, political forecasts and disease-diagnosis. He was widely travelled man and addressed the elite audience almost throughout the world. 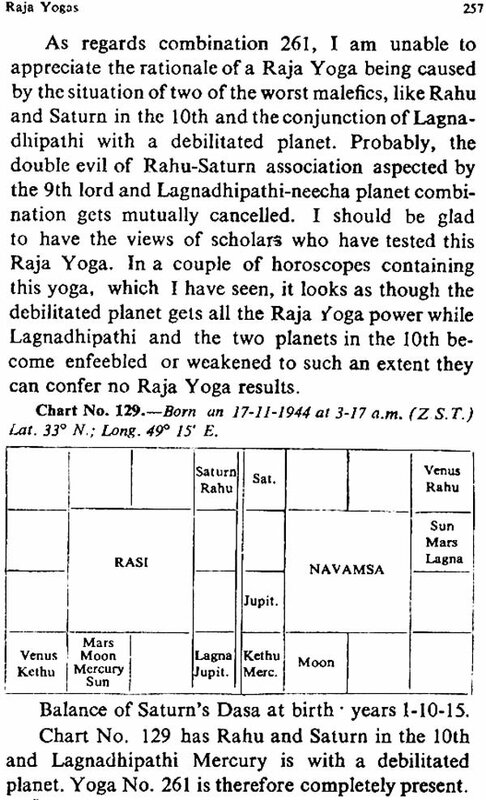 "Dr. B.V. Raman provides an astrological treat to the practitioners and students of the science by detailing three hundred planetary combinations that point to the yogas (fortunes) and aristhas (misfortunes) with 150 practical illustrations which he claims he had gathered from actual lives." The importance of Astrology in the social life of mail is manifold. Human needs and aspirations furnish a continuous motive power for astrological inquiry. Astrology has a definite relation to the several grades of urgency into which the needs of human being in society can be divided. Success in life depends to a large material prosperity or adversity. 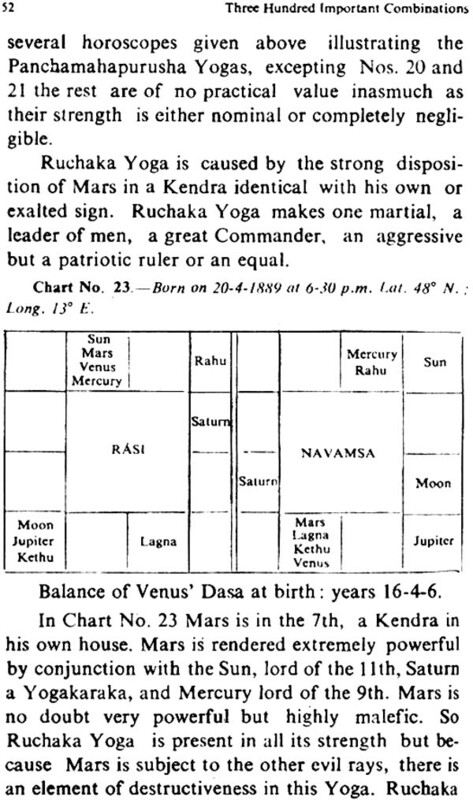 Yogas in astrological parlance tend to show the degree of wealth, fame, rank, position, adversity, ill-health and misfortunes a man is likely to enjoy in his present life as a sequel to his own actions in previous states of existence. In other words, the different specific planetary combinations show a summation of inherited physical and psychological tendencies which condition our present environment the extent to which we can offset the inherited tendencies by effort; the characteristics that will be domino,,? and those that will be recessive and so on and so forth. 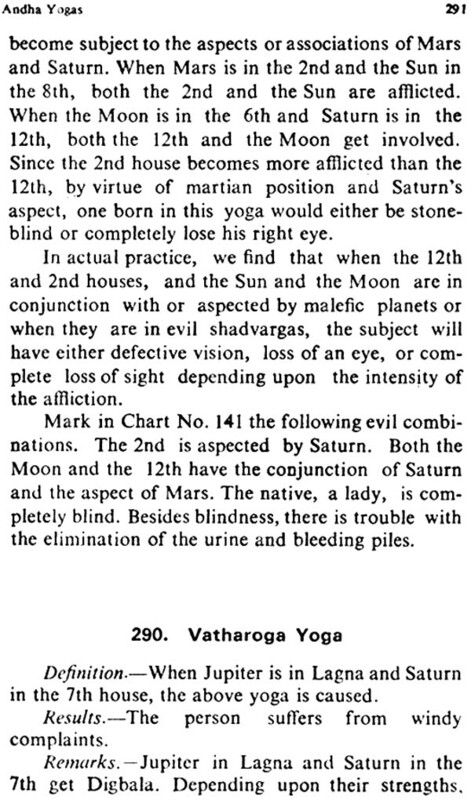 Strictly speaking, -all yogas are combinations of planets but all combinations cannot be Yogas. Only specific combinations can be styled as Yogas. 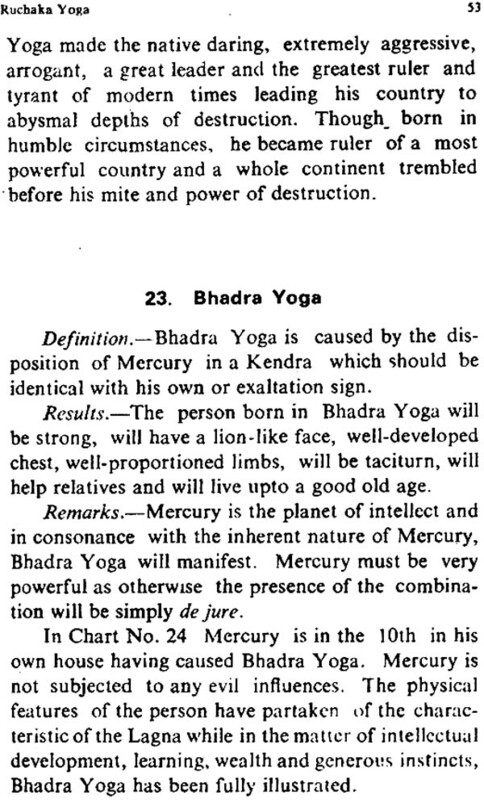 In this book, I have made an attempt to carefully select only such important combinations that could he raised to the dignity of Yogas and that could indicate certain definite physical or mental traits, or degree of wealth, fortune, or misfortune. To collect combinations at random is easy but to select notable ones illustrative of a variety of life events is not only difficult but even risky. should call this book a research project in the sense the material used forms part of the vast scheme of investigations I have in view. 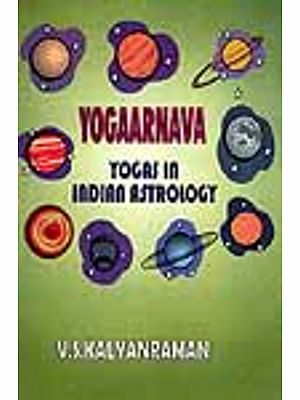 Modern astrologers seem to have overlooked an exceptionally fertile field of investigation in their indifference to study of Yogas which forms, as it were, the essence of Indian Predictive Astrology. 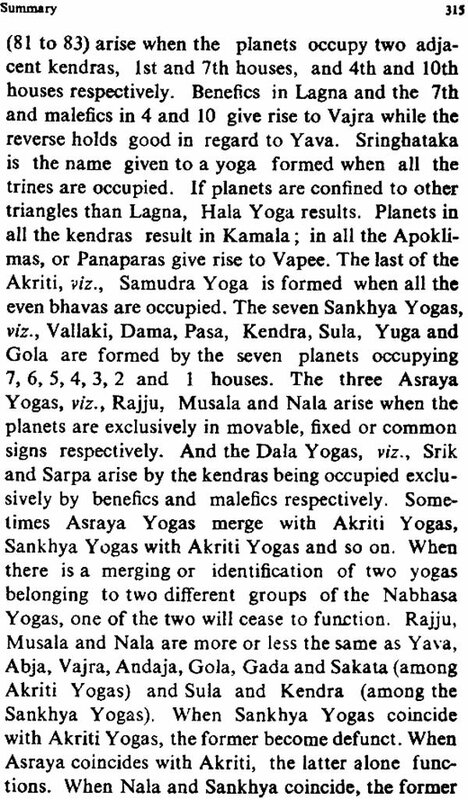 Most modern writers are silent on the subject of the Yogas except perhaps for some odd remarks upon a few common Raja Yogas or Arishta Yogas. For this reason, there has been for several years a demand for a book devoted specially to the predictive significance of Yogas and the present work- has been undertaken to meet this demand. Long back this want was supplied by my grandfather. Prof. B. Suryanarain Rao whose excellent book Satavogamanjari deals with some of the most important Yogas on the subject. But I felt that a more systematized account of all the important Yogas should be brought out so that, illustrated by a number of practical horoscopes, the work may stand as a foundation upon which future research may be developed. Therefore Three Hundred important Combinations is intended to provide a working knowledge of the Yogas which indicate specific horoscopic trends. The astrological mathematics required for this purpose is very elementary. Numerous examples especially designed to illustrate points arising in the elucidation of the Yogas have been inserted and as these are worked out fully, readers should have no difficulty in following the principles clearly. Points of a controversial nature have shelved - glossed nave beers approached from the point of view of their practical applicability. 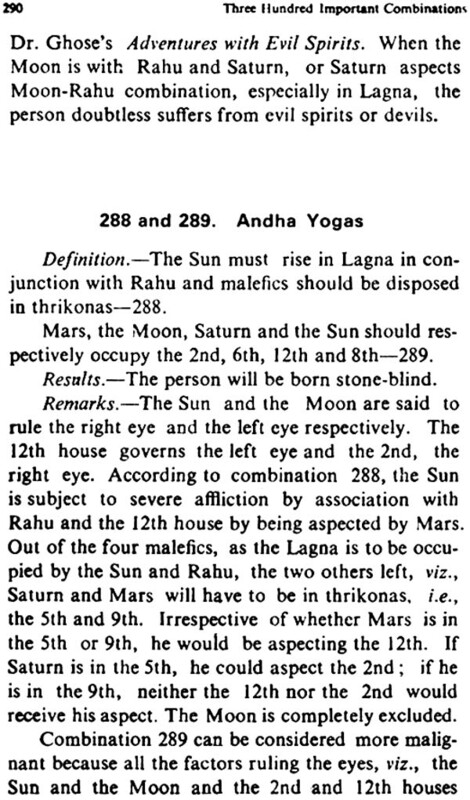 Al] planetary combinations may be divided into two broad groups, viz., Yogas and Arishtas. Though by the word Yoga is meant a combination, in actual practice Yoga is always considered to imply a fortunate combination. Arishtas generally deal with misfortunes though they are also included in the generic term Yoga. 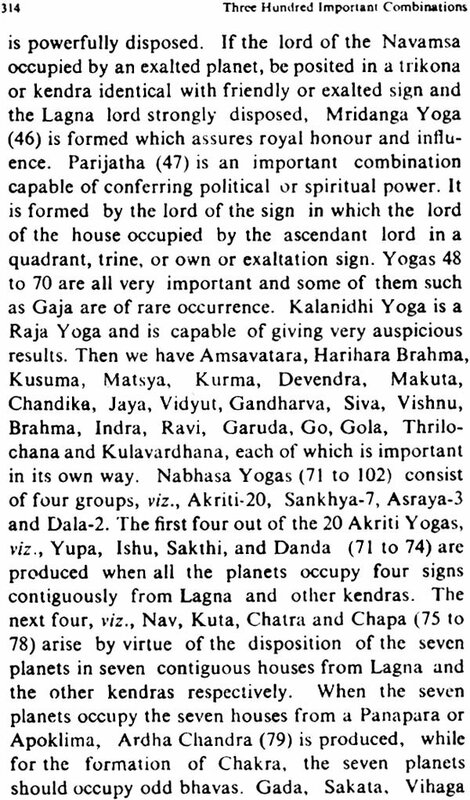 The Yogas may be Raja Yogas (political power), Dhana Yogas (combination for wealth) or Gnana Yogas (combinations for real higher knowledge and spirituality). The subject of interpretation of Yogas is briefly dealt with in the first few pages of the book. This branch is to be specially studied by the student of astrology in as much as it enables him to evaluate the exact implication of a particular Yoga. 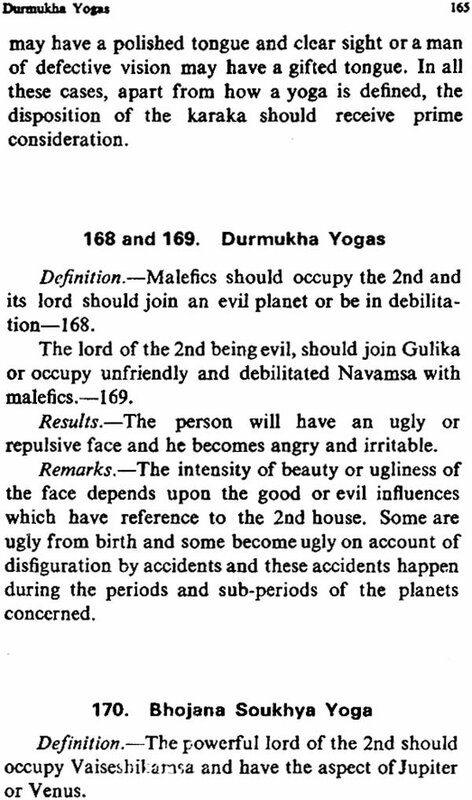 Special Yogas, including what are called Nabhasa Yogas, have been dealt with, with suitable illustrations wherever necessary. 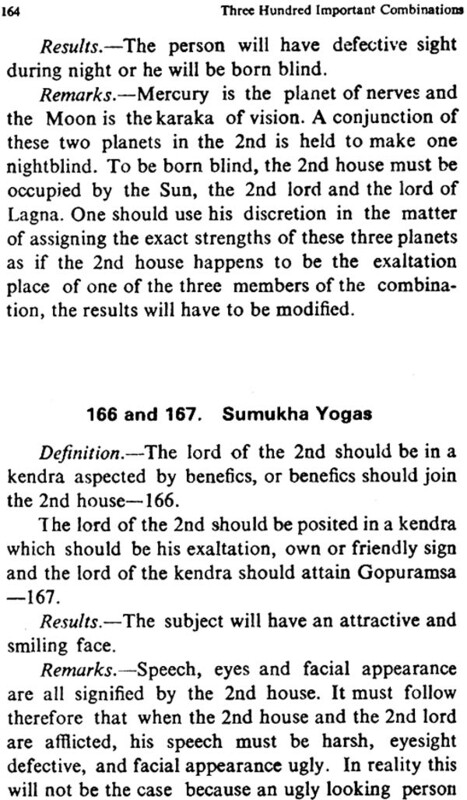 The difficulty arising when two or more Yogas coincide such as would be the case in respect of say Asraya and Akriti ,Yogas (see page 102) have been suitably clarified with proper explanations. 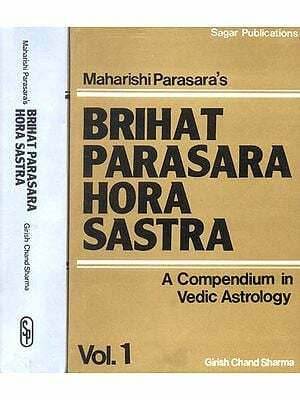 In a way, the latter part of the book is more important, for it deals with such outstanding combinations as Raja Yogas, Arishta Yogas and Neechabhanga Raja Yogas about which, of late so much fuss is being made by a section of astrological students. The last pages give a summary of the entire subject, matter. 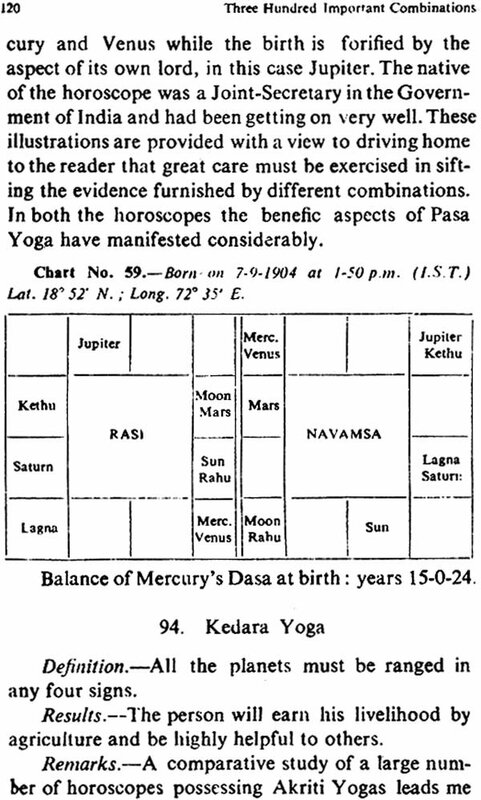 The example horoscope, with which the book is closed, should be of particular interest to readers, for it shows how, in the face of many Yogas existing in a particular case, only a few can operate. it also demonstrates that in respect of certain Yogas, the indications become effective throughout life while in regard to certain other Yogas. The results can happen only during specific periods and not always. For such a work as this which largely rests upon the principles furnished by classical astrology no originality can be claimed. But I feel I can certainly claim credit for being the first to bring together alt scattered information, present it systematically, and prove its practical worth and utility. The truth of this becomes evident when it is remembered that this book carries nearly 150 practical illustrations most of them being gathered from actual lives. I have as my readers scholars, intellectuals, students and practitioners. Therefore, to meet such different tastes and angles presents difficult problems of authorship, especially that a book dealing with the practical aspect of astrology should not merely aim at an uncritical exposition of the subject-matter. The only way to gratify the readers and at the same time preserve the theme is to present the apparently dreary principles in a graduated form and give the book a simple readability by interspersing the difficult sections with remarks which will not only elucidate the difficult points hut encourage the casual reader to take a more positive interest in the study of the subject. 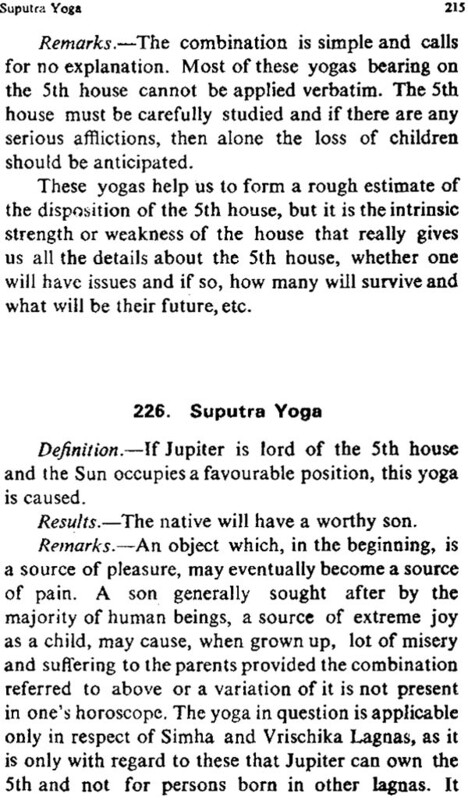 it is hoped that the exposition of Yogas presented in this book will stimulate readers to pursue the subject further. This book is intended to place before my readers three Hundred Important Planetary Combinations comprising a comprehensive list of human transactions including fortunes, misfortunes, death and various physical and mental worries and elations, financial troubles and successes and all other events connected with human life. Man wants to know something of everything connected with his career and the lives of those who are dear and near to him. 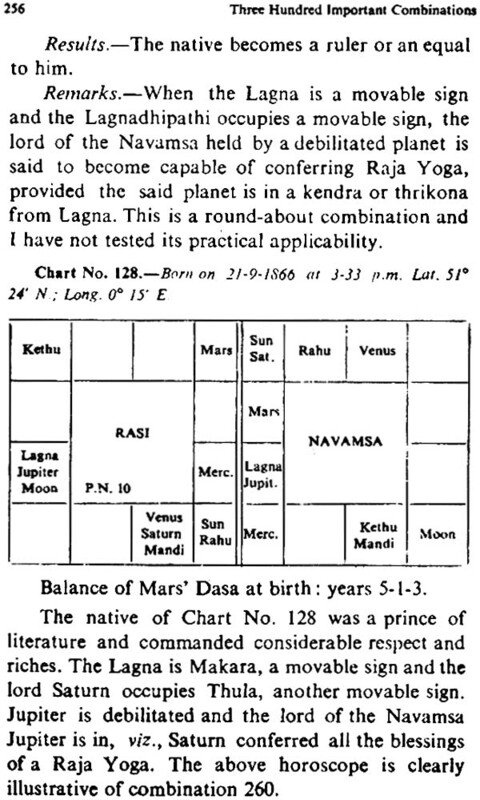 These three hundred combinations include a large variety of his life transactions and a previous knowledge of these happenings will be of immense benefit to him so that he may not only take remedies to avert the evils indicated by the planets from time to time but also adjust his affairs where the remedies prove ineffectual. Human life falls under two grand divisions— Yogas and Arishtas, or fortunes and misfortunes. 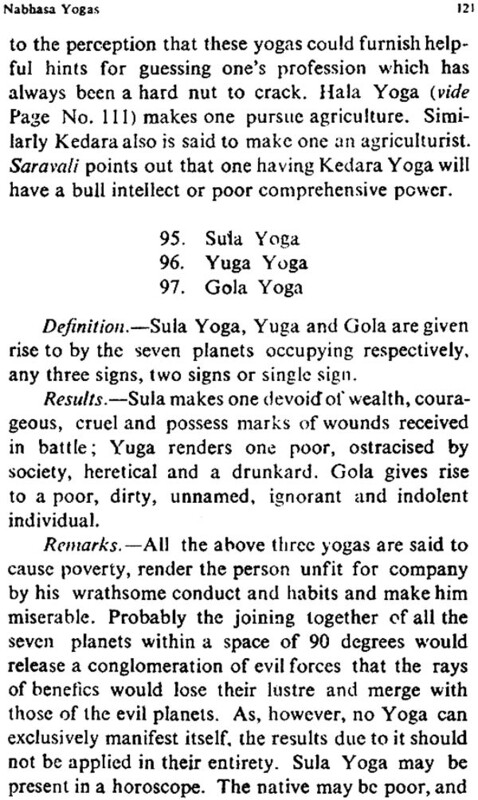 Yogas include success in every line—health, persona lity success in politics, financial gains, good education mental strength, bodily health; good wife, dutiful children, sympathetic friends and relations, righteous conduct and other sources of pleasure and enjoyment which generally go under the name of fortunes. Arishtas or misfortunes include all sorts and sources of sorrows, worries, miseries, troubles, distractions bodily and mental disturbances such as ill health physical and mental deformities financial losses ugly and bad children quarrelsome wife hateful relations and friends evil temper sinful nature and other unpleasant sources in life which go under the name of evils or misfortunes. 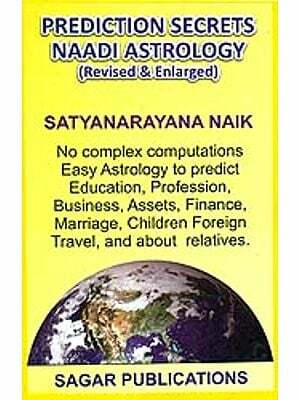 Therefore there three hundred combinations will be especially useful to astrological readers and students. I shall try and give the necessary explanations and notes where they are needed to make the meaning of the combinations clear.